Locals of Mallig, Isabela are quite on a buzz after a resident was said to have killed a snake with feet of a lizard. The snake was found in the residence of Gambol family in Barangay Olango. 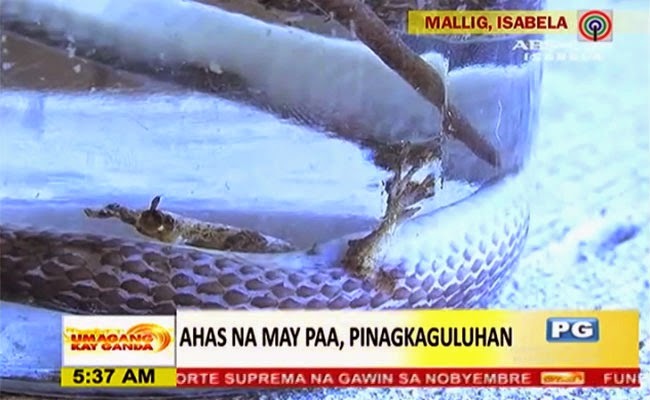 As reported by ABSCBN News, Noberto Gambol Jr was cleaning their house when he noticed that there was a snake on the floor. He shared that at first he thought it was a rope but when it moved by itself, he had realized that it was really a snake. The said snake suddenly took cover in a box where they finally killed it, but they soon realized that it was no ordinary snake. They were amazed to discover that the snake had feet like those of a lizard. Gambol regretted killing the snake and shared that he would not had killed the snake if only he knew that it was special. With the incident, the residence shared their different theories. Some joked that the snake might be an offspring of the dragon carved on the door of Gambol Family. While some say that the snake could have brought luck, another older resident, Anacleto Ramirez, said the snake could be a sign that the world is coming to its inevitable end. According to Arnold Frogoso, a Forest Specialist in Isabela, the snake is a product of a genetic mutation. Gambol Family decided to preserve the rare snake.